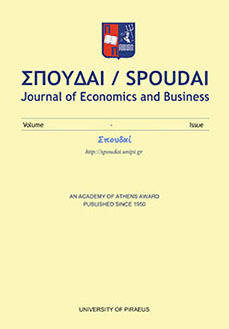 SPOUDAI is a peer-reviewed journal, publishing rigorous analytical papers, theoretical and empirical that deal with contemporary economic and business issues. It fosters both theoretical and quantitative contributions to Economics and Business. SPOUDAI not only serves as a link between theorists and practitioners, but also builds a bridge between economists and their colleagues in related fields. Contributions which make use of the methods of mathematics, statistics and operations research will be welcomed, provided the conclusions are factual and properly explained. Indexed in: ISI (International Scientific Indexing), SHERPA/RoMEO, OAJI (Open Academic Journal Index), Journal of Economic Literature (EconLit Database), EBSCO, Google Scholar, Research Papers in Economics (RePEc), EconStor, National Documentation Centre of Greece (EKT), Universal Impact Factor (UIF), DOAJ (Directory of Open Access Journals), EconBiz, EconBib, ZBW (German National Library of Economics) – ECONIS. The Issue for the Volume of 2018 Issue 4 is open for new submissions. Authors are welcomed to contribute with original papers. For submission details visit Online Submissions.